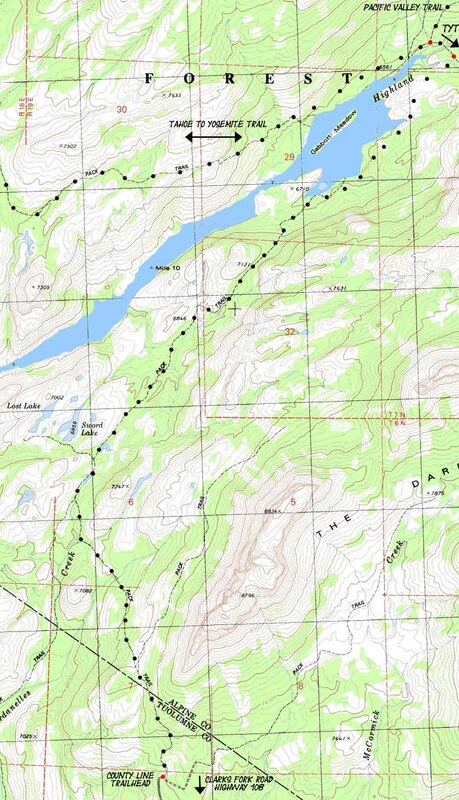 This map connects the Tahoe to Yosemite Trail route with fairly short route from a trailhead off of Clarks Ford Road to the end of Spicer Meadow Reservoir. This is a fairly short and easy way into the Wilderness and onto the Tahoe to Yosemite Trail. It's also the way into a short backpacking out to Lost and Sword Lakes, maybe even on to the Campsites out at the end of Spicer Meadow Reservoir and back to the County Line Trailhead.